April 2010 brought the surprise announcement that HP was purchasing Palm for $1.2 billion. It wasn't a surprised that Palm was for sale or that they had found somebody to buy them up, the surprise was that it was HP. Of all the companies that had been rumored, HP had never come up in discussions (aside from the ramblings of a crazed lunatic of a blogger back in December 2009). 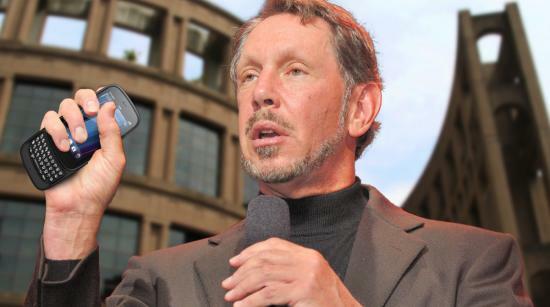 But there were plenty of other companies that had considered that purchase, and today Larry Ellison confirmed in court testimony that his company - Oracle - had considered snapping up Palm back in the day. According to The Wall Street Journal, covering the finally-happening trial between Google and Oracle over the former's use of the latter's Java language as the basis for Android app coding, Ellison dished out that Oracle has for some time tinkered with the thought of entering the mobile space. Among them was a purchase of an existing mobile company, like Palm or BlackBerry-maker Research in Motion. Ellison noted that HP eventually purchased Palm, placing the period of Oracle's interest in late 2009 or early 2010. As for RIM, Ellison stated that the Canadian phone maker was too expensive at the time - RIMM's market cap stood at around $35 billion at the time, today RIMM is valued at around $7 billion (which happens to be right around RIM's 'book value' - cash and investments plus physical assets like buildings, factory equipment, servers, land, etc), still nearly six times what HP was willing to pay for Palm. Of course, HP ended up buying Palm with the intention of taking a hands-off approach, then forced out the CEO that made the purchase, hired a CEO from an enterprise software firm who sent chills down our spine, announced three new webOS products, shipped one and then two, cancelled all of them, fired a CEO again, tried to sell the OS and couldn't, and then fell back to pushing webOS to open source. Amusingly, Oracle was a name floated the second time webOS was for sale, though apparently they didn't feel like writing a check to HP either. How could things have been different under Oracle? It's hard to say - it would have been their first foray into the consumer space (outside of Java, which Oracle purchased from Sun Microsystems in 2010). Would the company have taken a hands-off approach like HP was supposed to, or would the ever-outspoken Larry Ellison have had his way with Palm? If we had to guess, they probably would have taken the quasi-independent subsidiary route that Google appears to be taking with Motorola, but how that might have turned out differently for Palm and webOS, only in the Fringe universe do they have an answer. One thing's for sure: we would have had so much fun with an outspoken and no-nonsense Ellison leading the webOS charge.